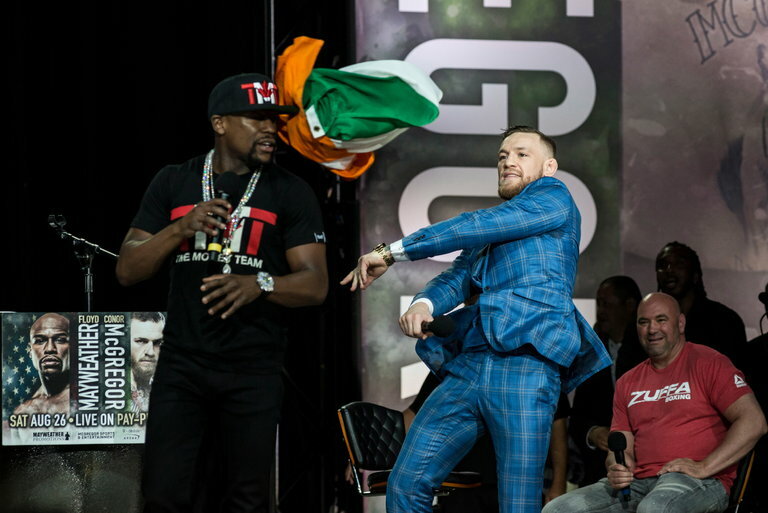 Conor McGregor, right, threw an Irish flag at Floyd Mayweather Jr. during a promotional event in Toronto on Wednesday. TORONTO — Conor McGregor played to a partisan Toronto audience and made fun of Floyd Mayweather Jr.’s tax problems at the second stop of their four-city promotional tour on Wednesday. They are scheduled to meet in an exhibition boxing match Aug. 26 in Las Vegas. McGregor, one of the biggest stars in mixed-martial arts, was clearly the fan favorite at the open-air Budweiser Stage, with the crowd chanting “Pay your taxes! Pay your taxes!” at Mayweather. The Internal Revenue Service still has Mayweather on the hook for $7.2 million in taxes from 2010, according to records that show a lien as unresolved. That’s on top of the $22.2 million he owes in 2015 takes — the year he earned $200 million to fight Manny Pacquiao. McGregor encouraged the crowd to shout expletives at the undefeated Mayweather and his family before launching into a profanity-laced tirade for nearly 10 minutes.